Tested on Xbox One X for the purpose of this review. Vampyr is another game added to the RPG genre but how does it stand up against the rest? Taking control of Jonathan Reid players will soon discover that Jonathan has a pretty dark side to him that even he didn’t know about, his thirst for blood soon reveals the fact he is actually a vampire and sadly for him his first victim is actually his sister with the need for blood to much and her being the first person he comes across! Reid is now chased by people who have seen his crime and want to kill the beast that he didn’t even know he was! Escape is Jonathan’s only hope and once he does the search is on to find the person who turned him into the beast that he now is. As with Vampires Jonathan can no longer handle daylight so to blend in and survive he gets himself a job in a hospital on nights meaning he can hide away from the sun during the day and work during the night! This does however carry a large problem for Jonathan in the fact he has a massive thirst for blood! Everyone in that hospital is a food source for him and he needs to make the choice on what to do, killing people will increase his power, whereas not killing will actually adjust the games difficulty and actually make things alot harder! The other trouble is killing people may make the game easier but it totally ends that persons story so it really gives the player a choice to make as they will be missing out on endless amounts of the games stories just by killing people which really doesn’t seem worth the loss! Characters in the game are all worth different XP and this can be found by using Jonathan’s Vampire senses. The characters in the game are actually all really interesting and make you always think twice before killing them and their story line off completely as anyone you meet you can actually eat, Jonathan interacts with the characters through a fairly basic dialogue system which does the job fine, there is a wheel with different options on what to say and from here it will give you further options to get more out of the conversations. The answers and questions all make a difference though as it will change how people feel about you and how helpful they will be to you so again it’s something that players will really need to think about before answering! Building relationships with the games characters will also benefit you when it comes to getting more powerful as it seems the closer you actually are to your victim the more power you will gain. Talking to your victims however isn’t the only way to do things you can also hypnotize them, doing this will give you the ability to actually take them somewhere quiet to eventually feed on them giving Jonathan a massive power boost! The game is all about the choices you make and keeping the community around you happy, killing is a necessity sometimes with the need for more power to take down some of the games more challenging bosses but making sure you choice the right person to sacrifice is essential as getting the wrong one could cause disruption and rock the whole community! London in Vampyr is filled with life and things to explore in it’s multiple districts, this is mainly at night because of Jonathan’s inability to be out in sunlight! The dark alleys scattered throughout are filled with dangers even to a Vampire, creatures called Skal as well as hunters trying to take down any vampires will try to kill without warning! killing these enemies gives Jonathan experience points and these points are what will help in gaining new abilities as well as improving things like health. The active skills that Jonathan can equip are accessed by going to his bed from here players can select the ability they want and use any experience point acquire to unlock the ability. Now onto the combat and while this is no Witcher level combat it does the job, players will need to lock onto a target and wait for the best opportunity to attack, stamina also plays a bit part in this as you will need to keep an eye on it to not run out. Jonathan also has a blood meter which allows him to perform different abilities and spells when there’s enough in the meter. Different weapons can be equipped as you progress through the game and using Jonathan’s Vampire sense aids the player in tracking blood splattered around the streets of London. Visuals and sound now and I’m pleased to say visually the game looks great! 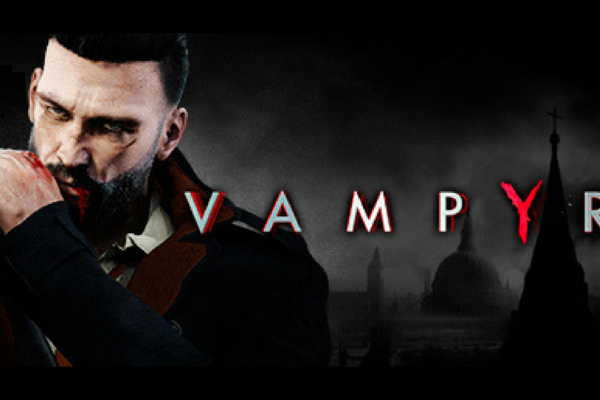 Most of the game is set in dark and dim areas due to Jonathan’s Vampire problems but London really looked good at times with an impressive amount of detail and nice lighting effects, performance was ok too although I did encounter a few framerate drops and texture popping but nothing game breaking. Now to the sound and it’s brilliant! The voice acting is really good with decent facial animations as well as a brilliant soundtrack that fits perfect with the games setting! Vampyr for me is all about the interesting characters, the combat is ok nothing groundbreaking or bad either it just does the job! Visually the game looks great with a few little performance issues and the sound is brilliant with great voice acting and a really good soundtrack that fits the games setting perfectly! Any RPG fan will love Vampyr and it’s definitely worth playing through and in fairness to it I can see it being a game that’s more than worth more than one playthrough just to explore everything the game has to offer!